Valentine’s Day deserves a romantic occasion to complement it. It is the time when people show their feelings of love and affection to their dear one. To make your Valentine’s Dinner perfect, treat your loved one to a special meal at The Buffet Table on the 14th February! 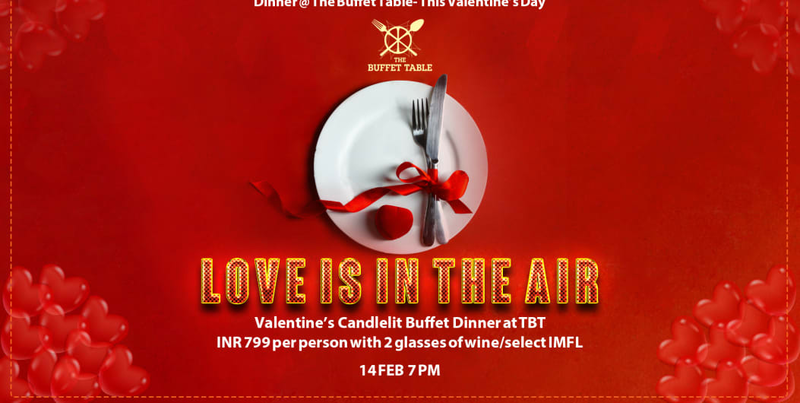 Enjoy the Valentine Special Buffet with a romantic setup and indulge in long conversations with your loved ones. The special buffet comes at INR 599* per person without alcohol and INR 799* per person with 2 glasses of wine or selected IMFL. Sip along the drinks and have a lovely evening.